It's amazing what a few years and some experience can do to change your mind and heart about something. Back when I first read the book And Tango Makes Three (a book that often shows up on the frequently challenged list) in 2009, I was still shaking off some of my very conservative Catholic upbringing. 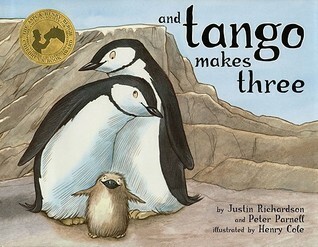 I wasn't offended by a book about two male penguins raising a baby penguin, I was just leery that it was too political to subject children to in the disguise of a children's book. Because my beliefs have progressed over the years, I read this story today with a much different perspective. What I once thought was too political for a children's book now seems like just a regular story about how families come in all shapes, sizes, and kinds. I do feel the need to apologize for even thinking that And Tango Makes Three had a political agenda. It's only political because we are still fighting for certain families to be accepted as "normal" and to be allowed the same rights as families with a mom and a dad. I hope that one day we can all read a book like this and just think to ourselves, "Oh, what a sweet family." I cringe to think that only a few years ago I didn't feel that way but am glad I have since seen the light. Appreciate your honesty on this. It is a lovely, loving book!